The following is a copy of information supplied by Guns and Ammo, which is part of Intermedia Outdoors, and is their intellectual property. This item has been reproduced here, purely for education and information purposes, in a hope to reach a wider selection of shooters outside of the USA. Should Intermedia Outdoors deem that this reproduction is an infringement of any copyright they have, we will gladly remove the item. The year 1964 brought us the Ford Mustang, Buffalo wings, the Moog synthesizer, and liquid crystal display (LCD) as well as a number of other iconic American inventions—not the least of which is the Ruger 10/22 .22 Long Rifle semiautomatic carbine. It’s one of the finest rimfire rifles ever conceived, and millions have been sold. Introduced as a rimfire companion to the then-new .44 Magnum Carbine, 50 years later the 10/22 remains one of the most popular .22 rifles. It’s accurate and extremely reliable. The detachable 10-shot rotary magazine is handy and works extremely well. Today, Ruger offers the 10/22 in a number of configurations, including Carbine, Compact, Sporter, Tactical, Takedown, and Target models. Over its lifetime, it’s been offered in others, too. I know of at least 20 different versions, but regardless of the configuration, a shooter experiences autoloader perfection when he chooses the 10/22. The 10/22 action is a blowback design, meaning the bolt is held closed by a closing spring and hammer pressure against the back of the bolt. With a chamber pressure of about 24,000 psi, the .22 Long Rifle isn’t what you’d call a very powerful round , so the light pressures required to keep the bolt closed in the 10/22’s action are entirely viable. When the rifle is fired, the bolt travels rearward and hits the boltstop pin. The rear face of the bolt is fitted with a groove and cam that causes the end of the bolt to dip slightly on impact with the stop pin. This action causes enough delay for the new cartridge to feed into the magazine. This is one of the reasons the magazine rotor spring tension doesn’t have to be heavy, thus making the rotary magazine easier for the shooter to load. The standard safety is a crossbolt type located at the front of the trigger guard, near the thumb latch. The rifle has to be cocked to activate the safety. When in the “Off” position, the safety shows a red line, indicating the rifle is ready to fire. As I mentioned, the 10/22 is currently offered in six standard-catalog configurations. My favorite is the Carbine, and I believe it’s probably the most popular configuration in the lineup. Let’s look at some of the different configurations that this classic autoloader has been offered in since its birth along with the current configurations. In 1965 the standard 10/22 took on the model designation of Carbine, and its stock was changed to a plain “hardwood” or birch or maple stock. The birch stock was discontinued in 2008. Some special limited-edition Carbines wore laminated-wood stocks of various color schemes. The current Carbine has the 18.5-inch barrel, folding rear sight, and bead front sight. Its overall length is 37 inches, and it’s available with either a hardwood or a synthetic stock. It’s offered with blued or stainless-steel barrels. By the way, the synthetic-stocked 10/22s were once catalogued as All-Weather models, then as Synthetic models, but now they fall into the group simply called Carbine. The Carbine is a perfect little field rifle: lightweight, compact, and easy to handle. The Sporter, first produced in 1966, is still offered today, and it has similar dimensions to the Carbine, but it’s a little fancier. Like the Carbine, it’s fitted with an 18.5-inch barrel, but at 5.75 pounds, it has slightly more heft. That’s because it has a fancier American walnut stock with nice checkering and sling-swivel studs. It does not have the carbine-style barrel band. Beginning in 1980 it was called the Deluxe Sporter, but today it is back to its original name. The Sporter is a little more expensive than the Carbine, but many shooters think it’s worth the price for the upgrade. The 10/22 Target model is designed for serious tackdriving. Accuracy is the key with this rifle. It comes standard with a 20-inch bull barrel and has an overall length of 38.5inches. At 7.5 pounds, it’s a real handful. It’s available with either a brown or a black laminated-wood stock with either a blued barrel and receiver or a stainless barrel and satin silver receiver. The Target isn’t fitted with sights, but it comes ready for a scope mount and optic. It’s been offered since 1996. The Compact model, which first appeared in 2006, has a 16.12-inch barrel and an overall length of 34 inches. It weighs a comfortable 4.5 pounds and is fitted with fiber-optic sights rather than the diamond rear and gold bead front. It’s available with a hardwood stock. 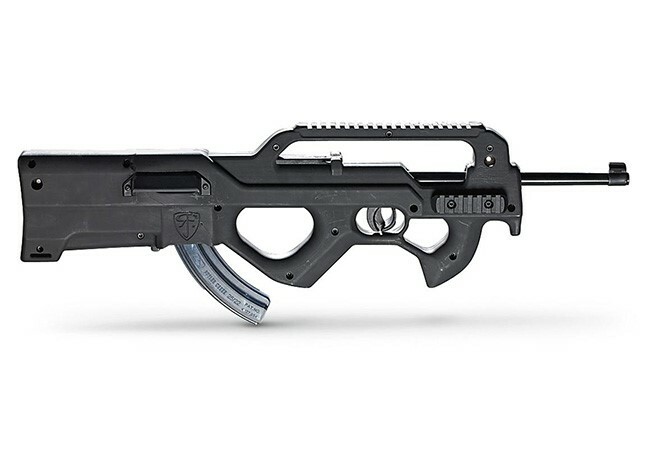 The 10/22 Tactical model is in a league of its own. It comes with a 16.12-inch barrel and either a black Hogue OverMolded stock or a black synthetic stock. The model fitted with the Hogue stock comes with a target bull barrel; the version with the synthetic stock has a standard barrel fitted with a flash suppressor. Like the Target, it doesn’t come with sights, but it’s fitted with a Picatinny rail, enabling the shooter to pick and choose optics. A bipod is attached to the fore-end of the Hogue stock. 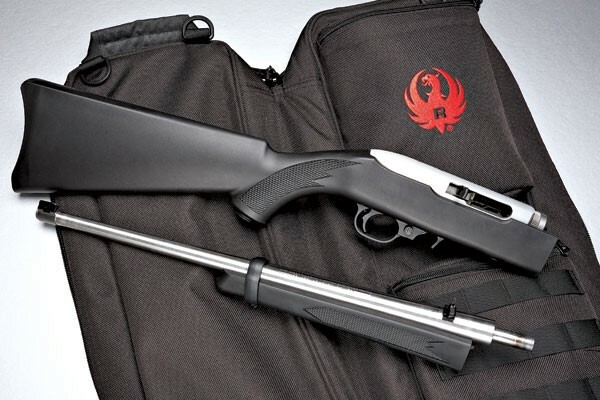 Introduced in 2012, the most recent 10/22 variation is the Takedown model. I am a big fan of takedown rifles, and I think it was an outstanding move for Ruger to produce the 10/22 in such a configuration. And I have to tell you it wasn’t exactly easy for the company’s engineers to make it happen. The Takedown is available with either a 16.62- or an 18.5-inch barrel in either a satin black or clear matte finish and with the standard flip-up diamond rear and gold-bead front sights. The stock is black polymer. What distinguishes this 10/22 from its brothers is that it is shipped in two pieces. As the name implies, it can be taken down into separate barrel and receiver/buttstock units. Other configurations that have come and gone include the Magnum (1999 to 2006), the Fingergroove Sporter (1966 to 1971), the 10/22 Rifle (2004 to 2006), the 10/22 Target Rifle (2001 to 2002), and the 10/17 Carbine (2004 only). The Magnum was chambered for .22 WMR and featured a blued 18.5-inch barrel, a steel receiver, a hardwood stock, and a nine-round rotary magazine. The Fingergroove Sporter was a .22 LR carbine with a Monte Carlo-style stock and a beavertail fore-end. The 10/22 Rifle was a .22 LR gun with a 20-inch barrel and a hardwood stock. The 10/22 Target Rifle had a 20-inch stainless-steel heavy barrel and a synthetic thumbhole stock that had an adjustable comb and buttplate. The 10/17 Carbine was chambered for .17 HMR and had an 18.5-inch barrel, a steel receiver, and a birch stock. Along with all those catalogued variations, the 10/22 has also been offered in several commemorative and distributor special editions. I’m not going to get into all of those configurations, but a few very interesting models were the MSP (Military and Special Police), the “FBI” gun, and the 40th Anniversary model. The MSP was a silencer-adapted carbine for law enforcement and military use. The FBI model (which stands for Faber Brothers Inc., not the Federal Bureau of Investigation) had laminated-wood stocks in reddish brown, light walnut, and tan colors, and they were marked FBI 00000 to 01500. The 40th Anniversary 10/22 (2004 only) had a walnut stock with a special medallion inset in the buttstock celebrating the 40th birthday of the Carbine version. Oh, there is also a special 50th Anniversary model this year. See the sidebar on page 50 for more details. I’m no stranger to the 10/22, though all my experience has been with the Carbine version. One afternoon in the early 1970s, I was visiting with my dad at our home in southern New Mexico when a package arrived. My dad opened it and found a brand-new 10/22 rifle. It had been factory engraved with full coverage on the top of the receiver. Dad then turned the gun sideways and saw the words “Bart Skelton 1972” stamped on the side of the receiver. “Here, kid,” Dad growled as he handed me the rifle. That little rifle became my everyday companion. When I got home from school, I’d load it up and take off into the desert. I couldn’t say how many rabbits I shot with it. I also took quail and coyotes with that 10/22. I fired an untold number of .22 LR cartridges through it. Unfortunately, I shot it so much that a hairline crack developed on the left side of the receiver, and my dad ordered me to permanently retire the rifle, much to my dismay. Shortly after parting with that engraved 10/22, I obtained another Carbine, which I still have. It’s one of my favorite little rifles. I’m not sure Ruger will be able to improve on the already fine line of 10/22 rifles, but I have no doubt this classic will enjoy at least another 50 years of absolute success. Posted in It's about shooting!